After an enticing test series, which turned out to be horrible for Pakistani fans, the Pakistan team has started the ODI series with a comprehensive victory beating Sri Lanka by 83 runs. Sri Lanka has now lost 8 consecutive matches on the trot while Pakistan galloped to their fifth consecutive win. 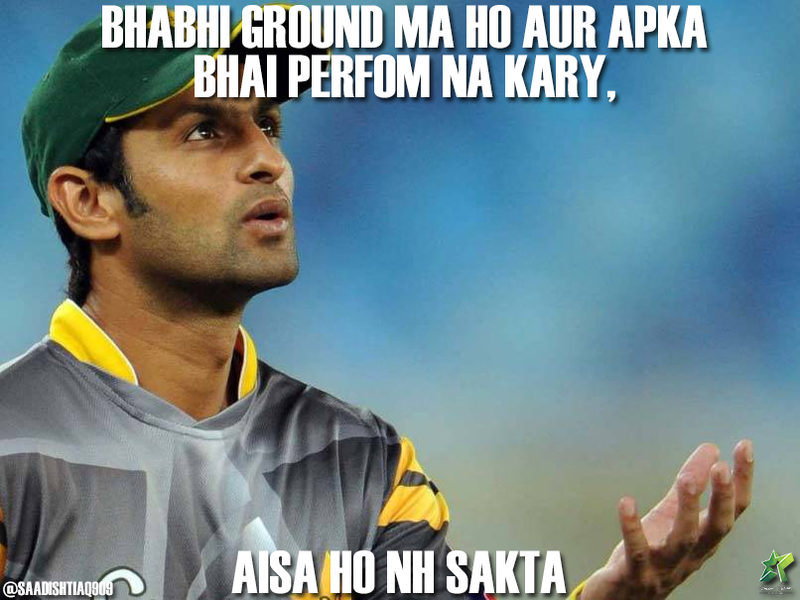 Shoaib Malik was declared the ‘Player of the Match’ for his aggressive innings of 81. Sri Lanka won the toss and elected to bowl first on a dry Dubai pitch, which looked like it might favour the slow bowlers. Pakistan started cautiously, but the opener Ahmad Shahzad failed to open his account, before falling to Gamage early in the innings reducing Pakistan to 11-1 in 3.5 overs. It is worth mentioning that he was coming on the back of some strong performances in the Independence Cup. Azhar Ali made way for the opening due to a knee injury. Fakhar Zaman and Babar Azam stabilized the innings before Fakhar got cleaned up by Dananjaya’s top spinner while playing across the line. Hafeez started well and just when he threatened to shift the momentum back to Pakistan, he got out in an eventful over which saw him getting out twice although the first time the DRS saved him. A 139-run stand between Babar and Malik ensured that Pakistan posted a decent total of 292, with Babar scoring his 6th ton while Malik romped to 81 off just 61 balls offering a much-needed impetus to the innings. Suranga Lakmal carried his test form into the ODIs, taking 2-47 in his 10 overs. Sri Lanka started off brilliantly in the chase before the left-arm quick Rumman Raees scalped Dickwella with a peach of a delivery. Chandimal couldn’t last much as he was judged LBW off Rumman when the scoreline read 34-2. Sarfaraz turned to the left-hander specialist Hafeez, who troubled the two left-handers Thirimanne and Tharanga with his guile and variations. He castled up the Sri Lankan captain after he miserably failed to read him off the surface. Sri Lanka was in a spot of bother when Hasan Ali took two wickets in two balls off a bouncer and a swinging yorker. Half the team was back in the pavilllion at 67. It was a brilliant display of fast bowling from Hasan Ali, reinvigorating the Champions Trophy heroics. The pressure kept on mounting and Thisara Perera holed out to Shadab in a bid to up the scoring rate. Hafeez was economical finishing with figures of 10-2-32-1, making sure that the required run rate kept on increasing. Thirimanne batted well for his 53 before being given out LBW off Rumman on the first ball of his second spell. Hassan Ali became the fifth bowler to take 5 consecutive three-fors. Dananjaya scored his maiden half-century but it was all too late. The tail delayed the victory for a while but Sri Lanka fell short of target by 83 runs. Both Hassan and Rumman took three wickets each to restrict Sri Lanka to 209-8. 12 balls pe 100 ap ki expectation kabhi puri nhn ho sakti bhalle 12 chake laga deta batsman ? 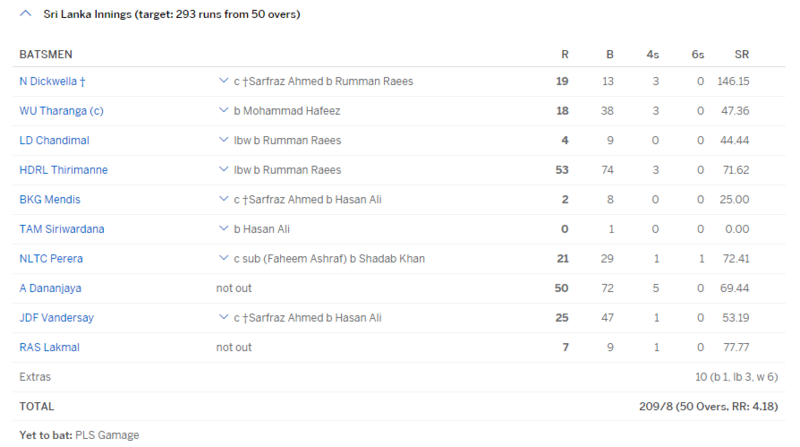 12 balls pe 72 strike rate Zero ka aur 6 chake baqi 6 balls per 36 runs kaise bana liye ??? We owe this result to Ahmed Shahzad. If He had stayed n the wicket, result would have been different. Why put a batsman name in title and for bowlers just put seamers. In sincere article. Ruman raees was the only bowler swinging the bowl and he is a great find after muhammad asif i dont know why he is not given importance. 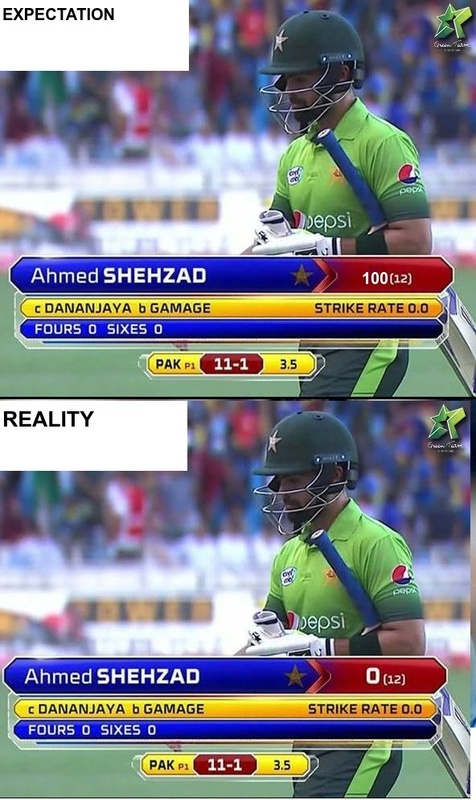 LOL is manhoos (Ahmed Shehzad) ko again kyun khila liya. Ab isko nikaly gy to ye b kahay ga “Koi btaiy ga mujy k Mujy kyun nikala”.